How much do we spend on our running costs? 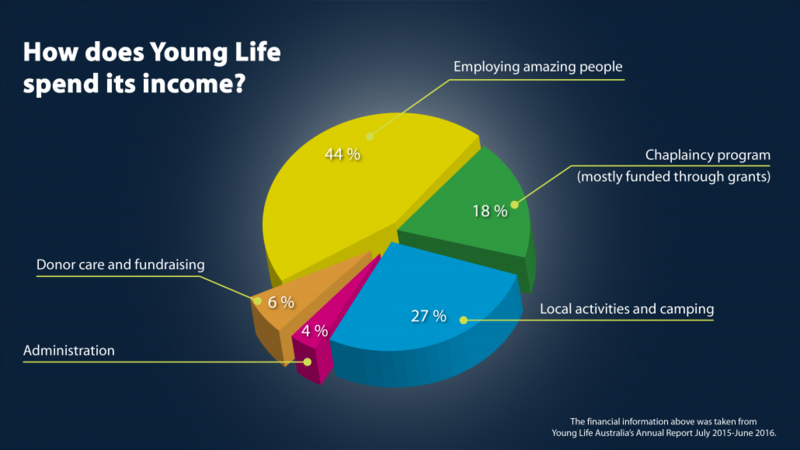 Young Life spent around 4% on administration costs in the last year. It’s a common question. NGOs should be accountable for how we spend donors’ money, and use the grants we are awarded. Transparency is important to us so we’re happy to provide the information. In this day and age, we see that administration costs bear the most scrutiny for non-profits everywhere, often with the notion that any amount not spent directly on frontline service is ‘wasted’ money. If we were good stewards of our money, we would put 100% of it towards direct programs, right? Are running costs a good indicator of good stewardship? We spend just on 90% of our income on the provision of direct services, which we’re pretty chuffed to be able to do! I think most of us realise that some level of running costs are inevitable. We all have to pay the bills, and working with young people does come with a certain added responsibility to maintain compliance and insurances. Think of it like building a house. If we spend nothing on the structure and load the place up with people and belongings, the house will eventually cave in. It needs to be built solidly, and continuing upkeep and maintenance. Good stewardship also means that we provide feedback and information to our stakeholders; from donors to parents, staff to volunteers. This means some of our organisation’s resources have to be set aside for things like this website; programs that manage our database and generate tax receipts; marketing materials to get people involved. Good stewardship means having people play to their strengths: area managers and staff whose primary role is to be great at working with young people, and other people who are great at supporting them with all the resources and red tape. Good stewardship is about sustainability, not just cost-saving. We’re not just looking at the current generation of young people, but the generations to come, and for us that means considered planning and investment. All of our people understand what it means to be careful with the resources entrusted to us, because we absolutely understand and value that every dollar you give is just that: an expression of trust. You haven’t given us cold hard money, but heartwarming belief in our mission: we don’t take this for granted! So while running costs are important, and we’re careful to be wise – even cautious – in how we spend, Young Life’s main focus will always be on providing our best support and care to the young people we connect with. Every dollar we spend on our running costs improves our service and our sustainability, so we can lengthen and strengthen our reach into their world. If you would like to chat to us further about how we manage our finances, please don’t hesitate to contact us. We’re happy to talk to you.